Decals printed by Fantasy Printshop. Includes vinyl paint masks for markings. 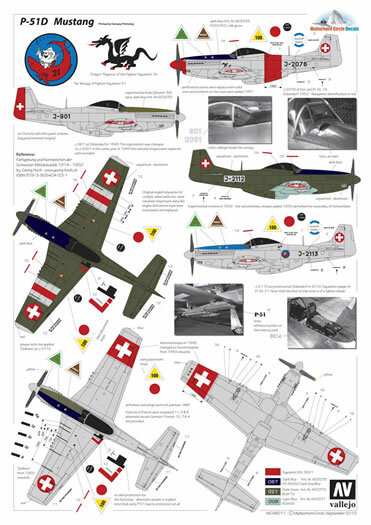 To celebrate the release of Tamiya’s superb 1/32 scale model of the North American P-51D, Roland Hoefling, the driving force behind “Wings and Tracks” hobby shop, has teamed up with Robert Schneider from Matterhorn Circle to release a set of decals covering the use of this aircraft by the Swiss Air Force. In 1946 it was clear to military authorities that the jet age had dawned, and the era of piston-engined fighter was drawing to a nigh. As the Swiss had had the opportunity to examine Hans Guido Mütke’s Me 262A-1a/R1 in April 1945, they were acutely aware of this development. Consequently, post cessation of hostilities, they initiated a series of explorations, settling on the newly developed de Havilland DH. 100 Vampire. This diminutive fighter, with a largely wooden construction, suitably impressed the Swiss authorities that they placed an initial order for four Mk.1 variants, to permit pilot familiarization, followed by a further 75 of the improved Mk.6 version. The problem facing the Swiss Fliegertruppe was what aircraft to use as an interim stop-gap to replace its defunct Messerschmitt Me-109 and Morane D-3801 fleet, until the new jet fighters could be delivered. 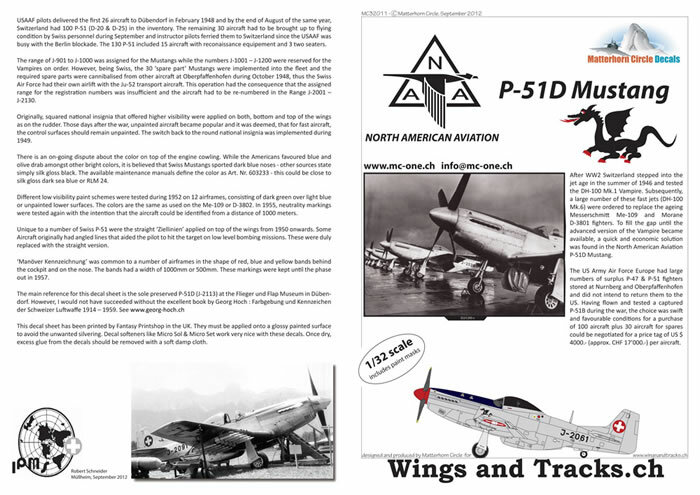 A communiqué in autumn of 1947 by the USAF that it was to release a vast amount of its equipment in Europe, including North American P-51D Mustangs, under very favourable terms piqued the interest of the Swiss Air Force. The reason being that the Swiss Air Force had extensively tested a P-51B that had made an emergency landing in Switzerland in 1944, and had been very favourably impressed with its flight characteristics, particularly against their Messerschmitt Bf 109G-6’s, many of which were no longer airworthy after only a few months in service. A quick decision was made to order 100 fighters and a further 30 as a source of spare parts, as the USAF was not able to supply any necessary components, for a unit price of approximately US$ 4000.-. The first 26 aircraft were ferried from Oberpfaffenhofen, close to Munich in Bavaria, to Duebendorf, in February of 1948 and within 6 months the Swiss had 100 serviceable aircraft (P-51D’s blocks D-20 and D-25) in the inventory. Originally the air force codes J-901 to J-1000 were intended for use on the Mustangs while J-1001 to J-2000 for the to be acquired Vampires, “J” being used to denote “Jaeger – Fighter”. However, this was not be to be the case, for the Swiss being astute, were not ones to pass up a good bargain, and in scouring discharged the huge number of disbanded USAF aircraft, they managed to salvage sufficient components to render the 30 “spare” aircraft airworthy. Consequently, the aircraft received code numbers from J-2001 to J-2130. Of these 130 aircraft, 115 were assigned to interceptor duties, whilst 13 were equipped for reconnaissance duties, and three were converted to twin-seat hacks. In line with most post war tendencies, the newly acquired aircraft were left in their natural metal finish, with large high visibility squared national markings being applied in the usual positions on the top and bottom of the wings and the rudder. In 1949 the return was made to smaller circular markings, as applied to pre-war aircraft. A continued issue of debate and controversy is the colour of the anti-glare panel on the engine cowlings, with most sources claiming that it was dark blue. In the maintenance manuals, the colour is referred to as Art. Nr. 603233, which would be close to silk gloss dark see blue or RLM 24. A number of different schemes were applied to the P-51 in Swiss service. This includes an exploration of low visibility paint schemes 1952 on 12 airframes, consisting of dark green upper surfaces over either light blue or natural metal lower surfaces. On the other hand, to assist with aircraft recognition, the use of high visibility neutrality markings, which would permit aircraft recognition from a distance of 1000m, was tested again in 1955. A unique feature of Swiss Mustangs was the application of “Ziellinien” or “Aiming Lines” applied to the top wing surface from 1950 onwards. A common feature was the application of War-game “Maneuver Markings” in the form of 1m red, blue or yellow bands on the fuselage behind the cockpit and on the nose, which persisted until phase-out of the type in 1957. 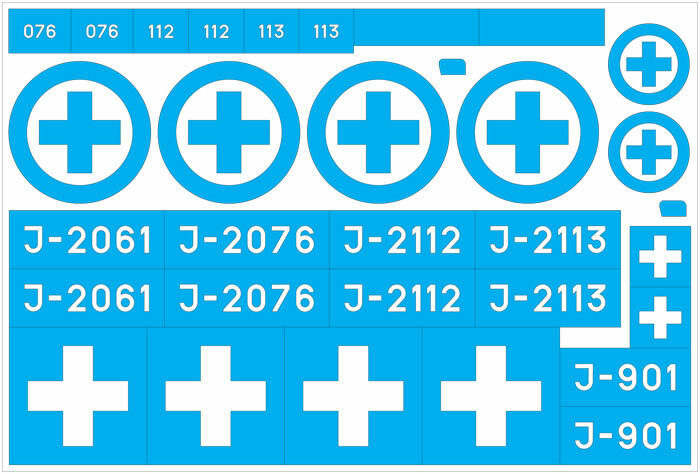 To ensure a high degree of accuracy for this decal set extensive use was made of the sole surviving P-51D “J-2113” in the Flieger and Flab Museum in Dübendorf, which is covered in this decal set. The authors also acknowledge the expert assistance of noted Swiss Air Force historiam, Georg Hoch. As for the recently released Hawk decals set, these decals are of the best quality printed by Fantasy Printshop, and include colourful squadron markings. In addition, a full set of vinyl masks is provided, for those wishing to airbrush national markings and aircraft codes, ideal for large-scale subjects. 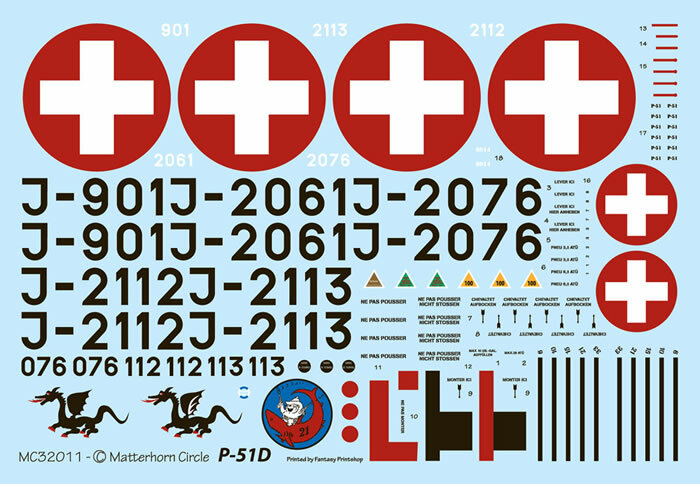 Use of the P-51D by the Swiss Air Force may not be a topic familiar to most modellers, but for those with a penchant for the different, this decal set offer the ideal tool to dress up that Tamiya Mustang a bit different. .